Product #17470 | SKU BOTTLE | 0.0 (no ratings yet) Thanks for your rating! 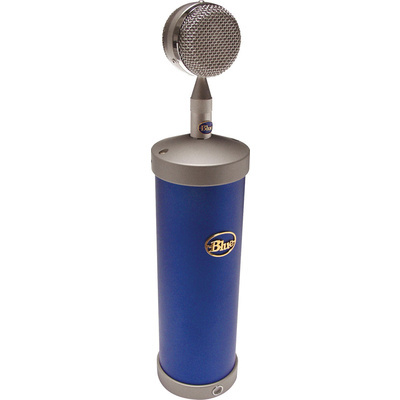 The Blue Bottle is an interchangeable, large diaphragm tube condenser microphone designed for professional recording. The output stage is based on a single hand selected vacuum tube (EF86 in triode mode) which provides a warm, analog saturated sound character that captures detail while maintaining a very low noise floor. The Bottle sports a vintage european microphone design that is both attractive and relative to it's flexibility. The Bottle features an interchangeable capsule design, the B6 dual backplate cardioid capsule is included and 7 additional capsules are available as options. Optional capsules provide a wide range of frequency and sensitivity responses while providing users with various omni-directional, figure of eight and cardioid polar patterns.The Bottle features a wide 30Hz to 20kHz frequency response with a signal to noise ratio of 67dB (related to 1 PA at 1khz). The microphone is powered via the Blue 9610 power supply (included) which features a SOFT START to ensure the longevity of the tube. The power supply connects to the microphone via the Blue "Champagne" cable which is optimized for the best possible signal transfer and durability. The Blue Bottle features a hand selected EF86 vacuum tube in triode mode. The end result is a rich, warm analog saturated signal while with transparent detail and low noise floor. One of the Bottle's major attributes is it's interchangeable capsule design. The Bottle comes with the cardioid B6 capsule, 7 optional capsules provide figure of 8, omni-directional, and variations of cardioid while delivering various sonic character as well as pick up patterns. The Bottle is equipped with the 9610 power supply unit, featuring SOFT START power up to assure the longevity of the tube. Also included is the Blue Champagne cable, connecting the microphone to the power supply unit. The cable is optimized to deliver transparent, pristine signal while maintaining the lowest possible noise floor. Polar Pattern B6 - Cardioid capsule is included, optional capsules provide omni-directional, figure of eight and hyper-cardioid at various sensitivity responses.